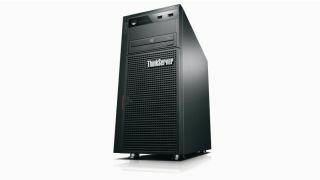 Claims TS440 and TS140 servers are "whisper quiet"
Tower servers look like conventional PCs but often make more noise, which is why Lenovo is aiming its two new ThinkServer models at 'small and midsized businesses' (SMBs) or Managed Service Providers (MSPs) looking for a "whisper quiet" machine. Its new ThinkServer TS140 and TS440 tower servers house Intel's latest Xeon E3 processors and offer 15% faster performance than previous generations, the company claims. The TS440 features Intel's E3-1200 v3 CPU, up to 32TB of RAID storage, chassis intrusion alert and can be used with optional 92% efficiency Power Supply Units. Lenovo says that the TS140, the smaller of the pair, has twice the I/O expansion, more RAID options and storage capacity than its predecessor, the TS130. It houses the latest Intel Xeon E3 processor and can be fitted up to four disk bays that support up to four 4TB disks. The TS140's small form factor could make it the more suitable of the two for retail deployments and more cramped office spaces. Both servers feature Intel's AMT 9.0 technology, part of Intel's vPro functionality that gives IT admins the management and security features needed to perform maintenance remotely. The ThinkServer TS140 is available from the beginning of September starting at US$421 (£370 excluding VAT). The TS440 will set you back US$679 (£620 excluding VAT) and will be released at the same time. Thinking of transitioning to a server? You might want to click here then.